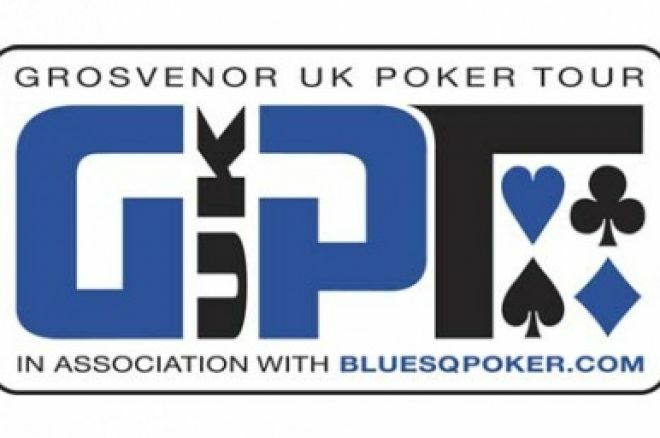 The Grosvenor UK Poker Tour has been one of the big successes of 2007. A regular deep stack festival which is both affordable and boasts a huge prize pool. An accompanying TV show making overnight stars of some and reaffirming the status of some of the big players in the game, such as Dave Colclough, Praz Bansi, Michael Greco and Julian Thew. The grand final at the Vic was always going to be a special affair. 199 players entered the £3,000 grand final at the Victoria Casino, London last weekend, all of them eyeing up the £197,600 first prize at stake. For fans of the Channel 4 show the going looked good for one of the previous leg's stars to make a repeat appearance, as a host of GUKPT stars took the lead early on. Newcastle winner Mazhar Nawab was the chip leader after day 1, closely followed by Neil Channing, Roberto Romanello and Dave Colclough – all of whom have had their fair share of GUKPT success. It took a while before the final table lost anyone at all, but Simon Zach and Paul Moss were 9th and 8th out respectively, both being the victims of being forced to shove light with short stacks. Owen Lock soon joined them when his pocket queens ran into the pocket kings of Sami Yusef. Dave Barnes and Carlos Barrera were the next to fall in 6th and 5th, Barnes made a move with King-Nine and got looked up by Ben Vinson holding Ace-Seven. Barrera clearly wasn't put off by this as he soon found himself making the same move with the same hand, this time running into the pocket queens of Michael Ellis. At this point we would like to wish a slightly biased well done to Carlos, who is a good friend of UK Pokernews and thoroughly deserved this big payday, which he parlayed from a £70 satellite entry. Vinson was the next to go, by now the chips were heavily weighted towards Friedman and Yusef he made a move with 8-6 and ran into the deuces of Ellis which became a set on the flop. This left the chip counts close to equal between Friedman, Ellis and Yusef. Talk of a deal were quickly scuppered by Ellis who wanted the prize pool to remain the same. Eventually King-Nine held up for someone, as a wounded Friedman got all his money in with Jack-Ten and was looked up by the K9 of Yusef. This left Yusef and the deal refusing Ellis to battle heads up. We talk about certain hands playing themselves and if one such example is always going to end a heads up encounter, it is Ace-King vs. Pocket Queens. The Queens of Yusef flopped a set but on a T-8-Q-J-6 board it was the Ace-King of Ellis that were good and pronounced Ellis the champion.